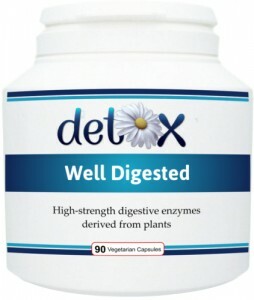 A high-strength supplement which combines a broad spectrum range of plant-derived digestive enzymes with carminative, anti-spasmodic and gut-soothing herbs. Digestive enzymes are important because they enable us to break down proteins, carbohydrates and fats into their raw components in order to make the nutrients available for absorption and utilisation. Over time, poor digestion leads to nutrients malnutrition and the beginning of a range of ailments. As recommended by renowned ND Max Tomlinson in Marie Claire magazine for bloating and digestion. * Don't know if you have low stomach acid? Take this simple test. First thing in the morning, before you eat or drink anything, put a heaped teaspoon of bicarbonate of soda in a small glass of water, stir briskly and drink. When the bicarb mixes with the stomach acid it should make you burp, a lot. If you are not burping your head off in 5 minutes then your stomach acid is low and you may benefit from taking Well Digested. 1 - 3 capsules before each main meal.